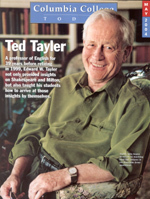 A former student recalls how Professor of English Ted Tayler made sure that his students came to their own conclusions about great literature. A look at the evolution of Literature Humanities and the distinguished professors who created the syllabi that still features some of the same books it did more than 70 years ago. Laura Cantrell ’89 is part of the changing face of country music, even if she’s not in Nashville anymore.